I was slightly worried I would have to peer inside a diaper and determine what kind of brown sticky chocolate bar had been melted into it, is what I'm saying. Or confess my total pregnancy weight gain so that someone could go home with a $10 gift card to the Cheesecake Factory for guessing correctly. Alison and Sherry, however, were like "yeah, no, we're not doing that" and instead chose to focus their energies exclusively on making everything as adorable as possible. Like, for example, the invitations. I mean, come on. Those are perfect. They even have a stripey back! I don't know much about baby showers, as I mentioned, but I did know that attending my own was probably a decent enough excuse for a cute new dress. Is that part of the tradition? I hope that's part of the tradition. I now have to have another baby just so I can actually wear it again. Or maybe I'll keep wearing it after I have Hamish but just stuff a pillow up there to accommodate for the extra material. Wait, no, best idea of all: DESIGNATED EATING DRESS. Perfect for holidays and family get-togethers! Speaking of eating, we did a lot of it at my baby shower. Alison and Sherry outdid themselves in the food department, whipping up a spread that included an arugula, goat cheese and pomegranate salad, nutella and mascarpone sandwiches on french bread, a Southern lemon meringue pie, macarons from the best macaron place in San Francisco, a fabulous cheese plate (all pasteurized, of course! ), bacon-wrapped dates, a fresh fruit salad, and homemade cheese straws. My absolute favorite thing of all however, were the egg salad sandwiches on white buns, a nod to my very specific first-trimester craving and, as Alison said, an homage to my mother, who provided me with a steady stream of them during the first fifteen weeks when I could eat little else. For favors, everyone took home cute little boxes of cherries, which have been one of my third-trimester cravings. My goodness, these girls and their attention to detail! 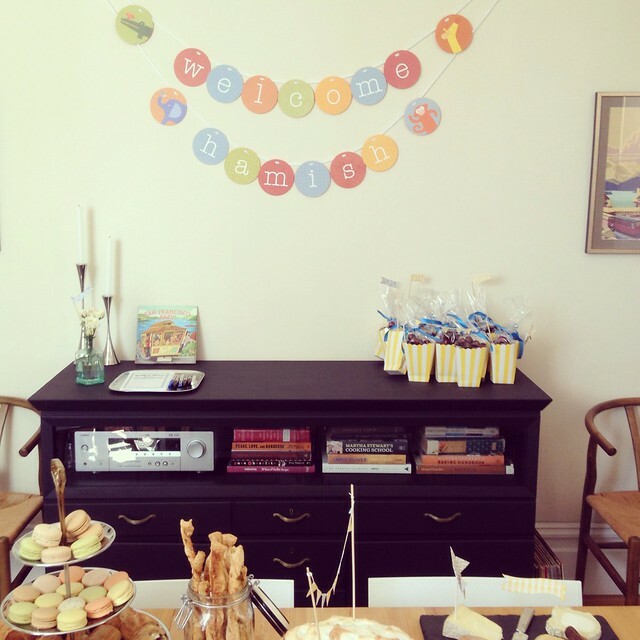 And while we're on the subject of details, check out this adorable banner that greeted guests when they walked in. I also got such a kick out of so many of the lovely cards and presents being made out to "Hamish," which I am beginning to think we are now actually going to need to call him for real, so that he doesn't end up having some sort of debilitating identity crisis when he's old enough to read. In the event that people got bored of eating, drinking, chatting and watching me open lots of gifts and sigh over the cuteness of them, Alison had a fun little game on hand. Wait, you thought I said there were no games? Correction: there were no games that people were a little reluctant to play. This game was a major hit, not least because you could do it quietly in a corner by yourself, just you, a Sharpie, and your imagination. It was basically Mad Libs: Holly and Sean's Baby Edition. Some of the responses made me laugh, some of them made me cry—mostly in a good way, apart from that person who predicted that my baby would come NEXT WEEK and weigh eleven pounds—and all of them made me want to take these little cards and make them into one of those photobooks that Hamish could look through every couple of years for the rest of his life. Do I have the best friends ever or what? I feel super, super lucky to have been feted so wonderfully, and I can't wait to introduce my kid to the sixteen new aunties who are so excited to meet him. I won't make any of them look in his diaper to guess what's in it. Aw, well, I'm so glad we were able to celebrate Hamish properly. And thank goodness you have such literary friends. The baby predictions turned into an impromptu game of Mad Libs! What a beautiful shower! I am jealous of all the cheese! My baby (who is 6 mon old today!) has a milk protein allergy. So no more dairy for me until I stop nursing. Ah the things we do for love. I thought the comment about Hamish having an identity crisis was hilarious. Our last name is Case and my husband and I are complete opposites on everything so Sawyer didnt have his name until about 2 hours after he arrived. We had already told people we were waiting to meet him before we named him but they just kept asking. So we started telling everyone that his name was Justin. JUST IN Case. It was hysterical to watch people put it together. But then my mother (and some others) thought that was so funny that sometimes she still calls him Justin that now we are wondering what we've done and try to use his real name as often as possible. haha. You might be surprised how much wear you can get out of maternity clothes, post-baby (espeically empire-waist dresses like yours - which is super cute, by the way). I have a couple of maternity dresses that I still wear 11 months after giving birth (and they just lay a little different, but still work). I am actually wearing maternity work pants right now (it's like my own little fashion secret - the comfort of yoga pants while still looking work-approriate - score!). Also, I love your blog and can't wait to "meet" little Hamish. My daughter was born on July 25 last year, so following along with your journey has felt especially relevant (finding out around Thanksgiving, holidays filled with morning sickness, counting down the days until OMGITSJULYALREADY!!!). I totally live in fear that I'll one day have to attend a baby shower where I guess the candy bar that's melted. So far, so good, but it's a deep, deep fear. Yours, however, looks lovely. Props to the hostesses! How lovely! I've only been to a couple baby showers as well and they were awful. Yours looks like one I would have wanted to be part of. Also, thanks for reminding me I have Nutella in my cabinet. I'm off to make lunch. 1. I ADORE that dress. I think you should have it taken in post-baby and wear it when you want to feel exceptionally pretty. Or maybe you could take the extra material and make a bow or something. Ha! 2. You DO have amazing friends. Macarons? Mini sammies? Those invitations?? Seriously great friends. Adorable, and can I just say that I love that you had only been to one baby shower?! that's utterly adorable! maybe hamish can be his middle name? in my culture, we have a baby party at the baby's 1st month party! not before because well, you don't really know what someone likes until you've known them at least a month, right? i think you should have a welcome hamish party at 1 month! then you can wear that pretty new dress again! So much adorableness and wow, am I hungry now. Um, but really this is a comment for the person above who joked about naming their baby Justin Case... I actually know someone whose name is Justin Case Lastname. Mean parents, but not TOO mean, since Case is his middle name. But still. I also know someone whose last name is Berry and they named their son Logan. Logan Berry. At least it will be hard for people to google him when he gets older. And I think I've mentioned here in comments before that my son also had a ridiculous in-utero name that we used throughout the pregnancy. All of his baby shower cards and my entire pregnancy journal refer to him as his joke name because we didn't reveal his real name until he was born. Funnily enough, though, the second he was born he just somehow ceased to be his in-utero name and became his real name to everyone. I thought for sure it would be hard to stop calling him by the nickname, but it wasn't. And now that he's a toddler he seems to be developing a great sense of humor, so I think one day he'll get a kick out of his ridiculous "original" name. This is adorable. I think you are the only person who has ever blogged about pregnancy that has ever made me enjoy reading it. Beautiful, BEEYOOTEEFUL! The baby shower, you, all of it! This has given me inspiration for my 1st cousin's baby shower which I decided the other day I want to throw her...on Sunday she told me she's pregnant which was a huuuuuge shock (we grew up together, we're a month apart in age and both turned 28 at the start of the year)...I'm rapt for her, though, and still in delightful disbelief, heh heh. They say it takes a village, and it looks like you have the makings of a most wonderful team of villagers to support you for the next few years. Well done, Friends of Holly! A house can be made to look through various things.